During a recent trip to New York City, photographer Dan Winters had a chance encounter with a personal hero: Robert Frank, whose 1958 book “The Americans” helped to alter the direction of photography as art, shattering the traditional boundaries of mood, texture and content in street photography. 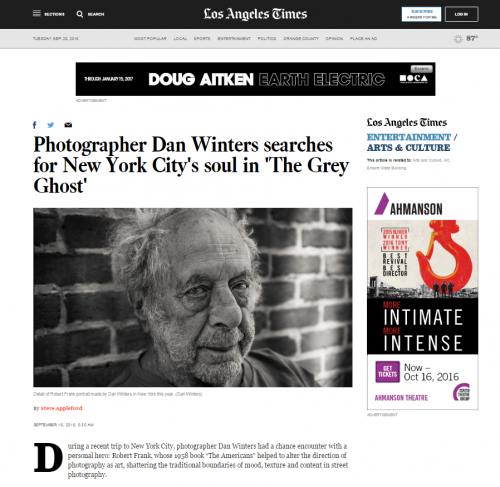 Winters has collected his three decades of New York pictures into a book, “The Grey Ghost,” which is also the subject of an exhibition at the Fahey/Klein Gallery on La Brea Avenue through Oct. 15. The black-and-white images are a dramatic contrast to his vivid, colorful work as an acclaimed magazine photographer. The New York pictures date to the early 1990s, when Winters relocated from Thousand Oaks to pursue a photography career. During days off, he would wander the city for pictures, drifting from Staten Island to Times Square to the Empire State Building. And he didn’t stop: Some pictures were shot in the last couple of years.